My positive rating is for this product as a blush because as a lip stain this didn't do anything for me. As a blush though, I liked this -- and I'm not typically fond of liquid or cream blushes. It imparts a natural-looking, dewy flush. Though it initially goes on sheer, it's buildable. And it holds up well thorughout the day. 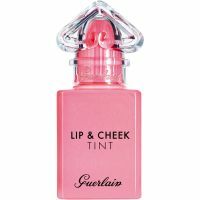 This liquid imparts a pretty sheer wash of color to cheeks and lips. I really liked how it added color to my face for my no makeup, makeup look for a saturday morning. The only problem was it feathered up on my lips and did not look smooth or even after a couple hours. The color on my cheeks remained the same -- smooth with a pretty flush of color.